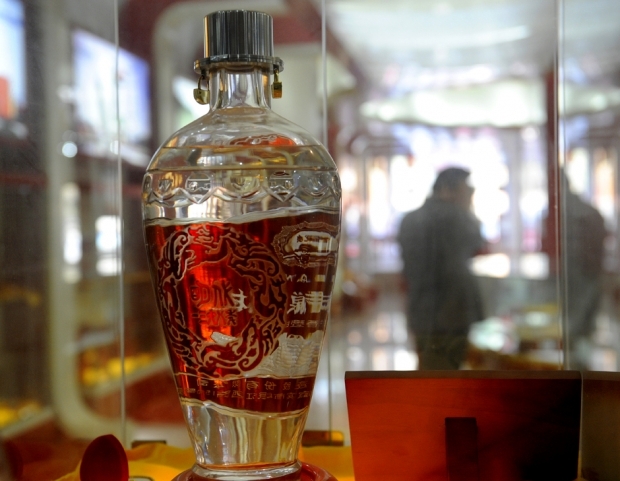 A bottle of baijiu made by the state-owned Wuliangye company on display in Beijing. By Caixin Staff Reporter Qu Yunxu. This article was first published by Caixin. Distillers of China’s most popular spirits, baijiu, are sobering up to a business slowdown and tight financing after a decade of outstanding growth. Sales are off and company market values have fallen over the past year, prompting some investors to cash in their bets on minor and big-name distillers alike. Industry leaders such as Tuopai Shede Wine Co., Kweichow Moutai Co. Ltd., and Luzhou Laojiao Co. attracted plenty of investors by racking up huge profits for four years straight starting in 2008. The centuries-old Sichuan Province distiller Sichuan Swellfun Co. won financial backing from Britain’s Diageo Plc., the world’s largest spirits company. And last year alone at least fifty distillery investors flocked to the Guizhou Province town of Maotai, home base for the profitable Moutai brand, seeking a piece of the action, said local baijiu businessman Han Chunyang. But spirits industry growth came to an abrupt halt in the third quarter 2012 after the quality watchdog raised concerns about the safety of a type of baijiu produced by the Hunan Province company Jiu Gui Jiu Co. Samples of the company’s liquor were found to contain excessive levels of DBP, a chemical plasticizer that can damage the human immune and reproductive systems. Shortly thereafter, the industry faced another sobering predicament when the central government decided to launch a campaign against lavish banquets and gift-giving among public officials, traditional practices that often feature expensive alcohol. Since then, sales of upscale baijiu have slipped. Now, companies that could raise capital almost effortlessly back in 2012 are scrambling for financing. For example, in Maotai, Han said, not a few distillery investors have already left town. Sichuan-based Tuopai Shede is apparently among the baijiu makers that have been courting financiers in recent months. The company was considered a likely takeover target in July and August after reporting an eighty percent decline in the first half of 2013 profits compared to the same period last year. One of the company’s biggest stakeholders, the Shehong County government, then ordered executives to seek an outside investor. Tuopai Shede’s deputy manager, Zhang Cuifu, said in July that executives were talking to a fund run by CITIC Private Equity Funds Management Co. about a possible tie-up. The government-controlled food conglomerate COFCO also reportedly expressed interest. Tuopai Shede and CITIC later denied that they had been trying to cut a deal. The distiller admitted, however, that it was evaluating its assets and would have to obtain government approval before bringing on board a major investor. Shehong County twice tried but failed to reorganize Tuopai Shede’s ownership structure over the past decade. In the first instance, the prospective investor went bankrupt before a deal could be signed. The second attempt collapsed during the 2008 financial crisis. Other governments across the country have been seeking ways to invite outside investors for local liquor companies. In August, for example, Guizhou’s state-owned Assets Supervision and Administration Commission ordered twenty-eight of its state-owned enterprises, including Kweichow Moutai, to shop for new investors, prepare investment plans, and achieve a preliminary agreement by 2015. Moutai, a premium baijiu often favored at the highest levels of business and government, reportedly has lined up suitors. Money raised would be used to build mid- to lower-range brands that could be expected to generate solid revenue, a local official said. On the other hand, the government of Hebei Province, as well as local government investment bureaus for the city of Handan and Linzhang County, have decided to put more money into liquor-making. In August, these governments joined hands with the Sichuan-based distiller Wuliangye Group and private equity firm Hejun Consultancy to invest a combined 500 million yuan in Handan’s Yongbufenli Distillery Co. The company will make low-end baijiu. Majority stakeholder Wuliangye will supply the base liquor, Yongbufenli will provide branding and distribution, Hejun will devise a retail strategy, and the local governments will lend policy support. Wuliangye officials say they plan to follow this kind of local partnership strategy for future acquisitions over the next two years. Meanwhile, Diageo on July 23 became China’s first foreign-owned liquor company. Its 3 billion yuan takeover of Swellfun took seven years to complete. Swellfun reported a 338 million yuan net profit last year, up 5.3 percent, despite weaker cash flow. Diageo’s international distribution channels helped Shuijingfang boost overseas sales to 73.5 million yuan last year from 45 million yuan in 2009. As the central government’s restrictions on expensive spending squeezes makers of premium baijiu, distillers are moving down the market chain with mid- to lower-end product offerings. This is a segment that’s been traditionally controlled by small, local distillers. Some big distillers have tried taking over small-fry rivals, with mixed results. Most of Kweichow Moutai’s attempts at buying smaller competitors in Maotai have failed, prompting the company to start making its own moderately priced brands. But so far sales of Kweichow Moutai’s new brands have been disappointing, forcing price cuts. The price of a bottle of Feitian 53 has been slashed 360 yuan since June, to 1,159 yuan in August. The company also reduced prices for its budget-level Hanjiang and Renjiu brand liquors each by 50 percent. The premium baijiu distiller Wuliangye said in July it would start selling three brands in the budget range of 200 to 500 yuan per bottle. Company Vice President Peng Zhifu blamed government policies for suppressing sales of high-end liquor, forcing the company to move down to less expensive products. The big distillers are also locking up distributors through strategic partnerships and acquisitions. Kweichow Moutai, for example, in July signed an alliance with the Internet service Jiuxian.com to sell baijiu online and has used Guizhou Province’s baijiu trading exchange to sell in bulk. Kweichow Moutai is also trying to attract new dealers to its nationwide distribution network. Some baijiu distilleries, however, are seeking alternative ways to boost business. In April, Sichuan-based Luzhou said it invested up to 2 billion yuan to set up a liquor trading company. Luzhou said it would control 21 percent of the new firm, and that co-investors included about a dozen state-owned enterprises. Some industry sources say Luzhou’s move points to the liquor company’s branching out into financing. One source said it seemed liquor firms were being transformed into holding companies with diversified assets. The baijiu industry is no stranger to capital operations. For example, several distillers were snapped up in 2011 and 2012 by Legend Holdings, the parent company of technology giant Lenovo. Industry analysts at the time said Legend appeared to be building a baijiu conglomerate to complement its core business, which makes computers and electronic gadgets. But the strategy may have failed. Analysts say Lu Tong, who led Legend’s baijiu strategy, left the company in August after less than a year, apparently because he could not integrate the firm’s new baijiu enterprises under a single roof. Before joining Legend, Lu had managed and invested in numerous liquor distillers. He had succeeded by using a holding company to buy distillers, one at a time, and using each new asset as collateral to acquire another. But by the time Legend joined the game, the baijiu industry had already started to cool, and Lu’s strategy suddenly became outdated.